Mary Ann and Mallary Mason began planning their three-bedroom southern Ohio timber frame home with a vision. “Our vision of the house was to enhance the beauty of the area in which we located it.” Says Mary Ann of their plans for reclaiming an old farm that had become extremely overgrown. The property’s panoramic vista of woods and distant farms – the Masons can see for 10 miles – inspired them in planning their tall-posted modified Cape Cod with wraparound porch, the centerpiece of what is now their 310 acre working farm. The Masons hired Riverbend Timber Framing, Inc., based in Blissfield, Michigan, and Jack Moats Builders, out of Washington Court House, Ohio, to create their home, the first the Masons have built. Both companies had been highly recommended by two friends who previously had built timber frames in the area. The Masons planned for their home to have a rustic, Western flair, and decorative items were important to accomplish that look. One of the most cherished was a shoulder mount of a 750 -pound bull elk that the Mason’s son, Ben, bagged several years ago, on a father – son Colorado hunting trip when Ben was just 16. In terms of the overall design and shape of the Masons’ house, Stewart explains, a key feature was the reverse gable – a gable turned 90 degrees from the main roof direction in the back of the house. The gable provides space for the tall great room window. To accommodate the wrap around porch, the second floor walls were raised three feet so the roof of the porch could tuck under the second floor dormer windows. At the home’s center is a great room with a 26 – foot cathedral ceiling paneled in tongue and groove knotty pine. On one end of the room, the panel of windows rises nearly 23 feet high. Offering a broad view of a pond and fields, which are often dotted with grazing cattle and the family’s registered quarter horses. 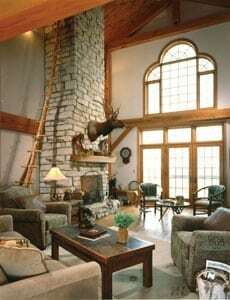 Above the mantel of the great room’s blue limestone fireplace sits Ben’s elk. Along one side of the fireplace leans a 27-foot handcrafted rustic wood ladder, a housewarming gift from a friend. “He had come over twice while we were building our home and he’d look at the fireplace and not say a word,” says Mary Ann. “Evidently he was constructing the ladder. We had no idea. 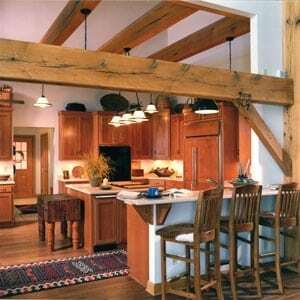 We just thought he was interested in the timber framing.” The ladder, made of a single cedar tree from the friend’s farm, ” enhances the beauty of the home tremendously,” says Mary Ann. The kitchen, which opens to the great room, has cabinets of quarter-sawn red oak, the same species of wood as the beams. The Masons installed strips of low voltage lights above the beams of the kitchen’s cathedral ceilings to softly illuminate the timbers and the higher walls. The kitchen floors are tongue and groove, varied width oak; counters are of sand-colored Corian. In keeping with their desire to make the home handicap accessible, the Mason’s placed their master bedroom on the first floor. The second floor includes Ben’s bedroom, a bathroom and a loft area. The Western theme carries throughout the house, from a saddle at the bottom of the stairs to a hide displayed on the loft railing. A chandelier created from the antlers hangs in front of a loft window. That celebration included placing a coin under a timber post – Riverbend gave a gold dollar coin – a tradition Stewart says comes from what is known as “stepping the mast” in old sailing ships. “That was for good luck, safe sail and fruitful life,” Stewart explains. “That tradition carried over to raising timber frames.” Mary Ann and Mallary took the tradition one step further. To ensure good fortune in their newly built home on the farm, they also placed quarters under each and every post.